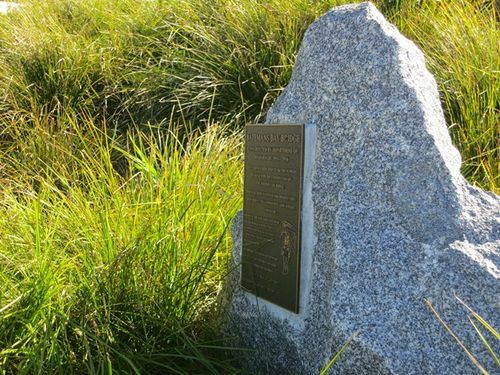 A monument commemorates the efforts of the workmen who contributed to the construction of the Batemans Bay bridge, which marked its 50th anniversary in 2006. It also pays tribute to foreman Bob Davis. The bridge built by the Department of Main Roads over the Clyde River at Bateman's Bay was officially opened for traffic by the Hon. J. B. Renshaw, M.L.A., Minister for Local Government and Minister for Highways, on 21st November, 1956. The bridge replaced the only remaining vehicular ferry on the Prince's Highway between Sydney and the Victorian border. The bridge comprises five steel truss spans each 120 feet, a steel truss vertical lift span 94 feet 6 inches in length, four steel plate girder spans each 62 feet long, and decked abutment structures at each end. The lift span when open gives a clear channel width of 75 feet for the passage of shipping. The overall length of the bridge is 1008 feet, the carriageway is 22 feet wide and a footway 5 feet wide has been provided on the downstream side. Was Always There For His Men. "With The Help Of A Lot Of Good Men"
He Passed Away On The 27 Dec 2007.